Select Belt Length - See Measuring Instructions none Large 38-44" mediumn 30-38"
Laminated leather cartridge belt with elastic pockets for no verdigris build up & versatility. Heavy duty Mil- Spec elastic. Buckle on and slide around until the cartridges are in front. Handy & quick. Designed by Tim Fallon of FTW shooting School. 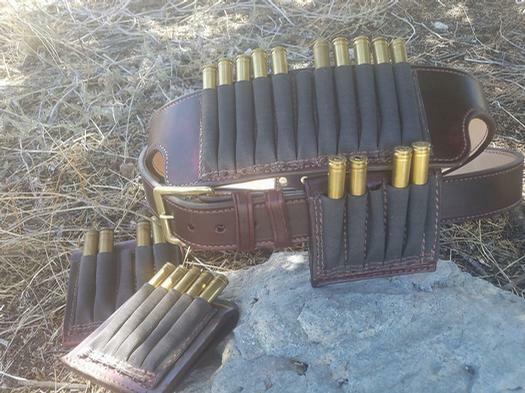 11 pockets so you can load the belt with five solids skip one load with 5 soft points. Or load the belt 2x2 or double gun use. Or fill it up. Add on 5x slides are also avaible. Two sizes fit a wide verity of waist sizes.